The joys of spring. Daffodils and bluebells creating a chorus of colour on the roadsides, new-born lambs feeding and an abundance of vibrant greenery flourishing on the bare branches where once there was none. It’s not only us that enjoy these vernal pleasures, our horses do too. After a winter spent in the stable, your animal will be delighted to get out in the pasture to graze and gallop about. Stretching their legs in the springtime sun can give us as much pleasure as our horses but there are also associated problems you should be aware of. As the ambient temperature starts to rise outside, worm eggs that have remained dormant on the pasture over the winter months start to hatch into infective larvae. Numbers of these larvae then begin to surge on the pasture. It has also been suspected that the change in temperature, allied with the lengthening of days, may trigger the emergence of encysted larval stages of small redworms (cyathostomes). These small redworms emerge from the gut wall, causing damage to the stomach lining. This damage can potentially cause diarrhoea, colic or weight loss and, in some extreme situations, even death. Targeted worm control is recommended. To minimise the risks of wormer resistance (anthelmintic resistance) a faecal egg count and a saliva tape worm test are recommended prior to worming treatment. Horses with worm egg counts of more than 200 epg should be treated. Tape worm can also be another hidden springtime danger for your horse. 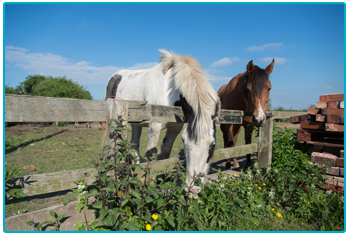 Speak to your Vet about saliva tape worm testing, EquiSal, which is recommended every six months. If you have not treated your horse for small redworm over the winter months, or you suspect an infection, then ensure that you select a suitable worming product, such as Moxidectin or a five-day course of Fenbendazole. Alongside a good worming programme, sensible pasture management techniques are important. 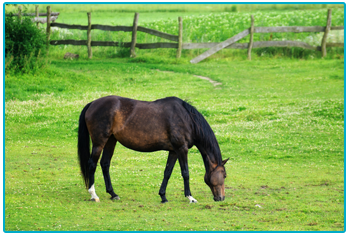 Make sure that you remove droppings and don’t use horse manure as fertiliser in your pastures, you could end up spreading the parasites. 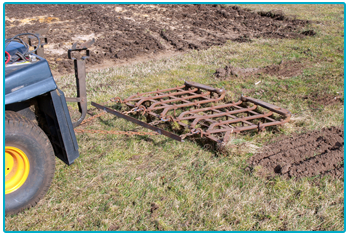 Use chain harrowing to bring dormant larvae to the surface and kill them. Other ways to avoid worm problems are mixed grazing and rotating your pastures. Isolate any newcomers for a period of time and avoid overstocking, as you could end up with a lot of droppings, increasing the chance of exposure to parasites. If you test your horse and a positive faecal egg count is present, worm them and retest them two weeks afterwards to see if they have any resistance to the wormer. If you experience any recurring issues or you have questions that you feel need answering, then don’t hesitate to visit your local vet. Worms are an easy enough problem to deal with once identified but if they are missed they could have severe, and upsetting, results for you and your horse.